Video (finally) of Marty Markowitz's outrageous claim to potential immigrant investors: "Brooklyn is 1000 percent behind Atlantic Yards"
OK, I posted the audio 12/8/10 and a link to the video on February 2. But Brooklyn Borough President Marty Markowitz's performance in a video presented to potential immigrant investors in Atlantic Yards is so spectacular that it deserves its own video excerpt, below. Markowitz claims, incredibly, "Brooklyn is 1000 percent, 1000 percent behind Atlantic Yards." He knows that's false. But it could help save Forest City Ratner some $191 million under the dubious exploitation of a federal program in which immigrant investors get green cards for themselves and their families in exchange for purportedly job-creating investments. 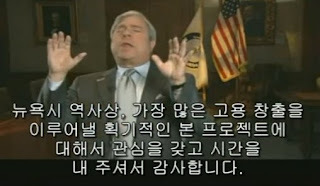 The original video, produced by the New York City Regional Center, an investment pool, is made available by a South Korean video-sharing site. It is hard to download, so the excerpt was created the old-fashioned way, by filming the screen. Markowitz closes by asserting that "there's nothing better than China and Brooklyn together." There's some irony there, given that the version shown here is subtitled in Korean. Forest City Ratner and the New York City Regional Center have sought 498 investors, 40 from South Korea. Was wondering what the obnoxious Energizer Bunny was up to, and sadly, his old games. UGH.